New houses - We lay entirely new drain systems for new builds. We do it once and we do it right. Maintenance - We can take care of all of your drainage repair and maintenance needs for both domestic and commercial properties. Septic Tank Installation and Maintenance - We repair and maintain existing septic systems as well as installing new systems. 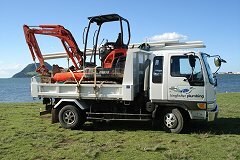 We highly recommend the excellent and environmentally friendly Hynds Lifestyle Septic Tank Systems for new installations. Our gasfitters are self certifying and constantly upskilling to bring the latest and safest gasfitting to your home or business. We have experience in commercial jobs like restaurants and factories, and have fitted out hundreds of houses in Tauranga with gas appliances. New Installations - If you’re thinking about installing a gas system in your new commercial or domestic build, or existing house, give us a call. We can do everything from consulting with you during the design process to recommending, supplying and installing the best appliances. Design - We can help with the design of your system and recommend the best products that will suit your needs. Servicing - We can service and repair your existing gas appliances and make sure that they’re kept running efficiently. Fires - We can help you to find the best gas fire from an amazing range of state of the art new products. Turn on the fire and control the temperature all with the touch of a button, while keeping the cosy, comforting feeling of a log burner. Instant Hot Water - Heat what you need when you need it. With options to fit controls around the house for specific appliances, or to set a safe and reliable feed of hot water around the whole house, we can design the perfect system to suit your life and your wallet.